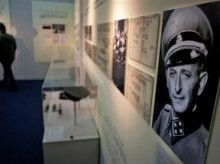 JERUSALEM—Fifty years after the landmark trial of Nazi criminal Adolf Eichmann began, Israel on Monday marked the event that ushered in a new era of openness toward the Holocaust and its survivors with an exhibition that highlights the man and his murderous legacy. Known as the “architect of the Holocaust” for his role in coordinating the Nazi genocide policy, Eichmann fled Germany after the war, was captured in Argentina by Israel’s Mossad and hanged after his 1961 trial in Jerusalem. The gripping public testimony of more than 100 Jews who survived extreme torture and deprivation captured world attention and vividly brought to life the horrors of the Nazi final solution to rid Europe of its Jews. The hearings also marked a watershed moment for the young state of Israel, where Holocaust survivors were often disparaged as weak victims in a nation that saw itself as heroic. The trial brought out stories of Jewish bravery and resistance that shattered the myth of Jews meekly walking to their deaths. As a result, more survivors went public with their lingering pain, which greatly helped research and commemoration efforts. “It marked a turning point in which the state of Israel and the Jewish people began to mete out justice to their persecutors and said: Enough! No more!” Prime Minister Benjamin Netanyahu said Sunday. The exhibit at Israel’s official Holocaust memorial Yad Vashem — titled “With Me Here Are Six Million Accusers,” a quote attributed to Eichmann prosecutor Gideon Hausner — includes some never before seen items such as Eichmann’s glasses, his red wallet and pages from a diary he kept while in an Israeli prison. His original fingerprints taken after his capture and an I.D. card under his assumed Argentine name, Ricardo Klement, are also featured. The exhibit shows photos of Eichmann in his more vulnerable moments: blindfolded after his capture, inspected upon arrival in Israel and reading in a sweater and slippers in his prison cell. “Eichmann was not a monster, but a man whose ideological goal was to destroy the Jewish people,” said Yehudit Shendar, the exhibit’s curator. Six million Jews were killed by the German Nazis and their collaborators during World War II, many of them following Eichmann’s blueprint for liquidating the entire Jewish population of Europe. At the trial, which began April 11, 1961, and continued for four months, Eichmann sat inside a bulletproof glass booth and calmly listened to the testimonies of some of those who survived his efforts to kill them. Despite claiming that he was just following orders, Eichmann was convicted of war crimes and crimes against humanity. He was hung the following year — the only time Israel ever carried out a death sentence. Recently released recordings reinforce evidence that Eichmann was no mere subordinate. “I was no ordinary recipient of orders. If I had been one, I would have been a fool. Instead, I was part of the thought process. I was an idealist,” he told a Nazi-sympathizing journalist friend in Argentina, according to a Der Spiegel report two weeks ago based on material acquired from the German Federal Archives. In the recordings, Eichmann is heard expressing frustration with not murdering more Jews. The academic adviser of the Yad Vashem exhibit, Gideon Greif, said that the exhibit — which includes photos of Eichmann inspecting raids against Jewish communities — debunks the myth of Eichmann as a gray bureaucrat. He described Eichmann as a driven, career-oriented official, who was frustrated by his own perceived lack of promotion and angered by never having had an audience with the Fuhrer. Greif said Eichmann was so motivated to kill Jews that he even went behind the backs of his superiors to do so, and he refused to spare even his own Jewish acquaintances. The Eichmann trail continues to captivate Israelis, 50 years later. Recently, a documentary was aired called “The Hangman,” directed by Netalie Braun, about the man who executed Eichmann — a prison service officer who guarded the Nazi criminal for six months and then drew the short end of the stick when the man who carried out Israel’s lone execution was chosen. Shalom Nagar, now 76, said he was traumatized by the experience, eventually came to terms with what happened, found religion and spent his life working as a kosher butcher. Marking the trial’s 50th anniversary, Yad Vashem, in collaboration with Google, launched a YouTube channel with video of the entire trial — more than 400 hours of original footage.